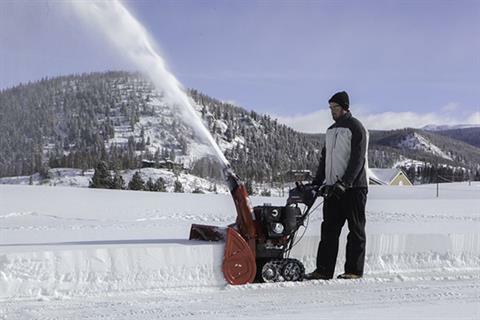 Honda's two-stage snow blowers are designed to throw more snow faster and farther. 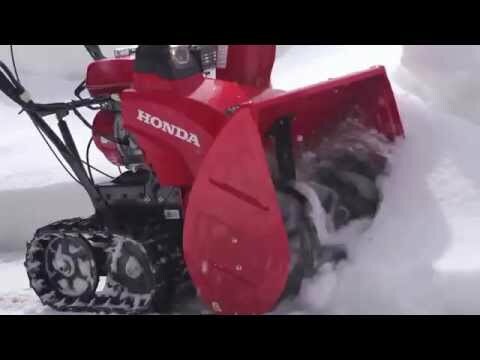 POWERFUL, EASY TO START HONDA GX ENGINE: The commercial grade Honda GX200 OHV engine offers plenty of power to churn through the snow. Starting is easy - even in cold weather. ELECTRIC START - NO PLUG IN REQUIRED: Automotive-style DC electric key starting makes your snow blower even easier. These models also come standard with recoil pull-start, for back up purposes. EXCEPTIONAL THROWING DISTANCE, 49 FT. MAX: Two-stage snow blowers use a fast spinning impeller in the discharge duct to throw snow faster and farther. The HSS724 has a larger impeller diameter for increased snow removal - offering throwing distances that exceed many competitors. 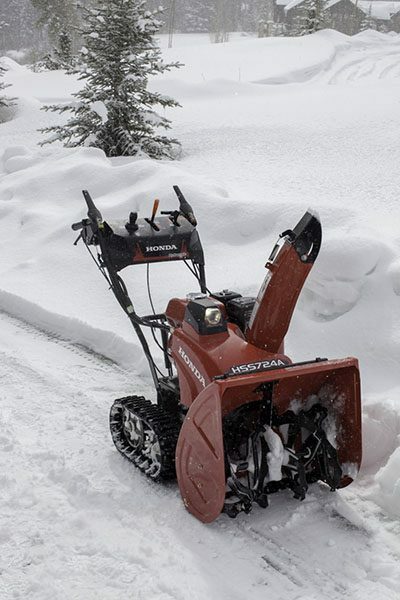 CLEAR UP TO 1,500 POUNDS PER MINUTE: The combination of Honda's GX series engine, optimized impeller pulley, and 90 degree impeller wing dramatically optimizes Honda's HSS series snow throwing capacity. 23.8 IN. CLEARING WIDTH, 21.7 IN. 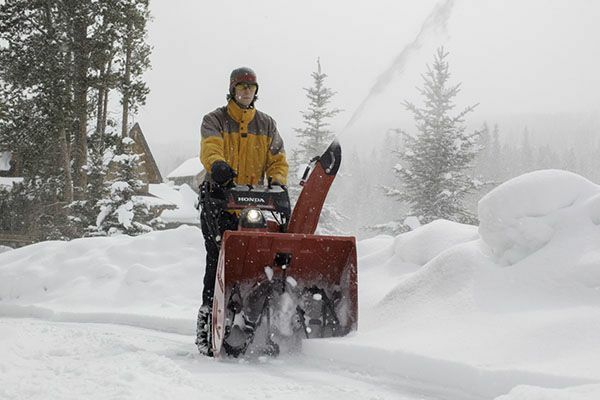 CLEARING HEIGHT: The HSS724 can handle large snowfalls with ease. TRACK DRIVE OFFERS THE BEST TRACTION AND CONTROL AVAILABLE: Dual track drive provides exceptional traction through most snow conditions. Pliable, low temperature rubber tracks with sure-gripping cleats, providing solid traction and ideal balance. Perfect for complete control on inclines, rough or uneven ground, and icy conditions. Provides a stable platform for attacking hard packed snow and ice. AUGER HEIGHT CONTROL - VARIABLE AUGER HEIGHTS FOR UNBEATABLE CLEARING ABILITY: The all-new auger height control lever allows you to easily adjust auger housing height with just the press of a thumb. Variable positions let you choose the best height for different surface conditions. Raise the auger for uneven clearing surfaces. Or lower the auger to clear down to the pavement or cut through hard packed snow - without riding up on the snow being removed. The auger height control gives you the ability to match the snow blower to your needs. HYDROSTATIC DRIVE - PICK THE RIGHT SPEED FOR YOU, WITH AN EASY SINGLE LEVER CONTROL: Control of forward and reverse speed is simplicity itself with Honda's hydrostatic transmission. Just move the lever forward or backward to go in the direction you want, at the speed you want. Infinitely variable speed means it's easy to pick a speed to match your snow conditions and personal preference. There's no shifting, and the ground speed doesn't affect the auger rotation speed. It's easy to control, and virtually maintenance free. ELECTRIC JOYSTICK CHUTE CONTROL - EASY TO ADJUST SNOW DISTANCE AND DIRECTION: The all-new electric 4-direction joystick chute control lets you reposition the chute on the go. With up to 198 degrees of rotation, the joystick chute control allows you to clear snow faster and more efficiently. FINGERTIP STEERING, EASY CONTROL, EVEN WITH THE ENGINE OFF: Left and right control levers provide easy and intuitive steering control. The steering control levers also provide easy movement and transport, even with the engine off. Just pull and hold both levers for neutral, then easily roll the snow blower. CONVENIENT CONTROLS: The HSS724 offers ergonomically-designed controls for operator convenience and safety. Controls are conveniently laid out and easy to reach. 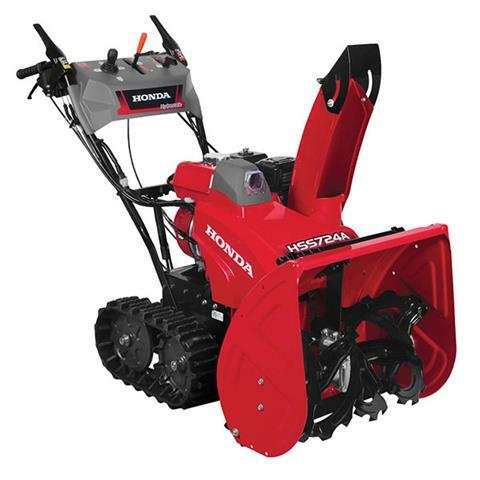 ICE BREAKING, HEAVY DUTY SERRATED AUGER: Honda's snow blowers are equipped with ice breaking, heavy-duty, serrated augers. To enhance performance and durability, the auger shaft is bearing supported. AUGER PROTECTION SYSTEM: The HSS724's auger drive shaft and impeller blower are protected by easily replaceable offset shear bolts. Should the auger engage a solid object, the shear bolt will break to prevent auger or impeller shaft damage. PNEUMATIC GAS STRUT: Honda's addition of a pneumatic gas strut to the auger height control system gives the user smooth and accurate auger housing adjustment. EASY TO USE INTERLOCKING DRIVE / AUGER CONTROL: One hand drive control allows you to easily adjust snow direction and distance with the chute controls. EASY TO REACH THROTTLE CONTROL: The throttle control lever provides manual control of the engine speed. HIGH POWERED LED HEADLIGHT: A powerful built-in LED work light makes the HSS724 easy to use, even in the dark. Provides exceptional lighting and high visibility in all conditions. The LED light offers performance and a lifespan that competitors' incandescent bulbs can't touch. REVERSIBLE SKID SHOES: Reversible, heavy-duty skid shoes provide twice the wear of regular skid shoes. ARTICULATED CHUTE: The articulated discharge chute offers precise direction and distance control of snow. STEEL REINFORCED AUGER HOUSING: Enjoy Honda durability with automotive-grade steel side auger housing and discharge chute. LARGE GAS TANK WITH GLOVE-FRIENDLY CAP: The HSS724 offers a large, easy to fill gas tank with a built in fuel gauge and a glove-friendly gas cap. CHUTE CLEARING TOOL: Conveniently located clearing tool in the unlikely event the chute becomes obstructed with slushy wet snow or ice. Maximum discharge - 1,500 lb. / min.